Database normalisation is a concept that can be hard to understand. In this article, I’ll explain what normalisation in a DBMS is and how to do it, in simple terms. By the end of the article, you’ll know all about it and how to do it. Click on the following headings to be taken to the relevant place on this page. Or you can just scroll down. Why Do We Need to Normalize a Database? What Are the Normal Forms? Want to improve your database modelling skills? Click here to get my Database Normalisation Checklist: a list of things to do as you normalise or design your database! Database normalisation, or just normalisation as it’s commonly called, is a process used for data modelling or database creation, where you organise your data and tables so it can be added and updated efficiently. It’s something a person does manually, as opposed to a system or a tool doing it. It’s commonly done by database developers and database administrators. It can be done on any relational database, where data is stored in tables which are linked to each other. 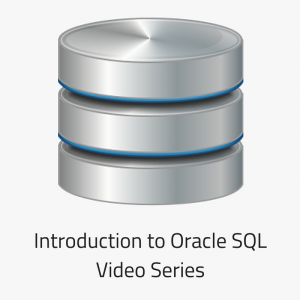 This means that normalization in a DBMS (Database Management System) can be done in Oracle, Microsoft SQL Server, MySQL, PostgreSQL and any other type of database. To perform the normalization process, you start with a rough idea of the data you want to store, and apply certain rules to it in order to get it to a more efficient form. 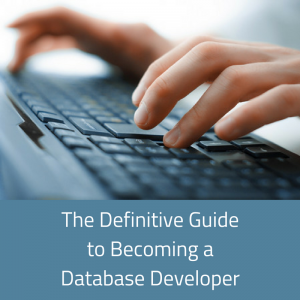 I’ll show you how to normalise a database later in this article. 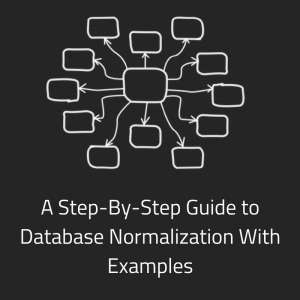 So why would anyone want to normalize their database? Why do we want to go through this manual process of rearranging the data? Normalization in a DBMS is done to achieve these points. Without normalization on a database, the data can be slow, incorrect, and messy. Some of these points above relate to “anomalies”. An anomaly is where there is an issue in the data that is not meant to be there. This can happen if a database is not normalised. Let’s take a look at the different kinds of data anomalies that can occur and that can be prevented with a normalised database. We’ll be using a student database as an example in this article, which records student, class, and teacher information. This is not a normalised table, and there are a few issues with this. An insert anomaly happens when we try to insert a record into this table without knowing all the data we need to know. For example, if we wanted to add a new student but did not know their course name. 5 Jared Oldham 0 ? We would be adding incomplete data to our table, which can cause issues when trying to analyse this data. An update anomaly happens when we want to update data, and we update some of the data but not other data. For example, let’s say the class Biology 1 was changed to “Intro to Biology”. We would have to query all of the columns that could have this Class field and rename each one that was found. There’s a risk that we miss out on a value, which would cause issues. Ideally, we would only update the value once, in one location. A delete anomaly occurs when we want to delete data from the table, but we end up deleting more than what we intended. But, if we delete this row, we lose the record of the Biology 2 class, because it’s not stored anywhere else. The same can be said for the Medicine course. We should be able to delete one type of data or one record without having impacts on other records we don’t want to delete. The process of normalization involves applying rules to a set of data. Each of these rules transforms the data to a certain structure, called a normal form. There are three main normal forms that you should consider (Actually, there are six normal forms in total, but the first three are the most common). Whenever the first rule is applied, the data is in “first normal form“. Then, the second rule is applied and the data is in “second normal form“. The third rule is then applied and the data is in “third normal form“. Fourth and fifth normal forms are then achieved from their specific rules. Alright, so there are three main normal forms that we’re going to look at. 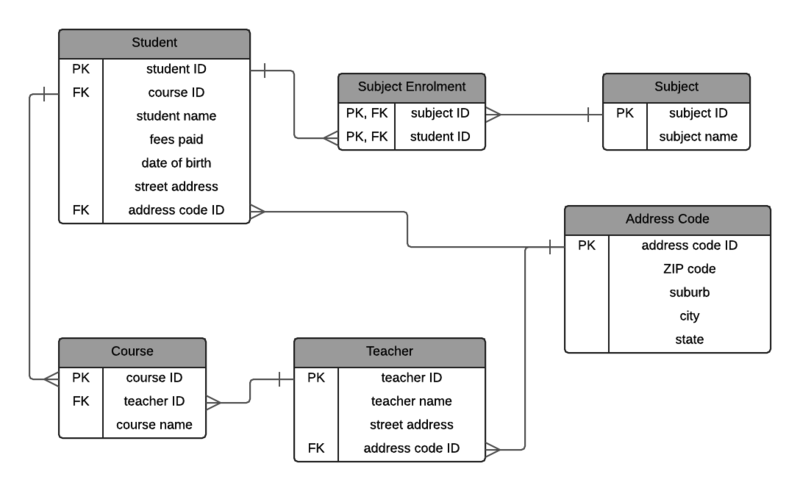 I’ve written a post on designing a database, but let’s see what is involved in getting to each of the normal forms in more detail. What Is First Normal Form? First normal form is the way that your data is represented after it has the first rule of normalization applied to it. Normalization in DBMS starts with the first rule being applied – you need to apply the first rule before applying any other rules. Let’s start with a sample database. In this case, we’re going to use a student and teacher database at a school. We mentioned this earlier in the article when we spoke about anomalies, but here it is again. We have a set of data we want to capture in our database, and this is how it currently looks. It’s a single table called “student” with a lot of columns. Everything is in one table. How can we normalise this? We start with getting the data to First Normal Form. Does the combination of all columns make a unique row every single time? What field can be used to uniquely identify the row? Let’s look at the first question. No. There could be the same combination of data, and it would represent a different row. There could be the same values for this row and it would be a separate row (even though it is rare). Is this the student name? No, as there could be two students with the same name. Address? No, this isn’t unique either. We don’t have a field that can uniquely identify the row. When we create a new primary key, we can call it whatever we like, but it should be obvious and consistently named between tables. I prefer using the ID suffix, so I would call it student ID. The way I have written this is a common way of representing tables in text format. 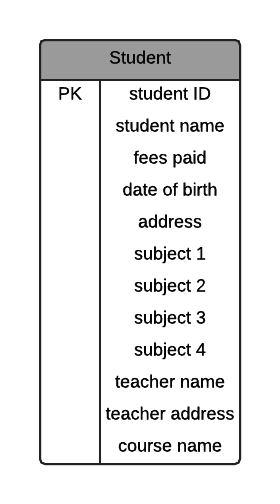 The table name is written, and all of the columns are shown in brackets, with the primary key underlined. This data is now in first normal form. This example is still in one table, but it’s been made a little better by adding a unique value to it. Want to find a tool that creates these kinds of diagrams? There are many tools for creating these kinds of diagrams. I’ve listed 76 of them in this guide to Data Modeling Tools, along with reviews, price, and other features. So if you’re looking for one to use, take a look at that list. What Is Second Normal Form? It means that the first normal form rules have been applied. It also means that each field that is not the primary key is determined by that primary key, so it is specific to that record. This is what “functional dependency” means. Let’s take a look at our table. Are all of these columns dependent on and specific to the primary key? student name: Yes, this is dependent on the primary key. A different student ID means a different student name. fees paid: Yes, this is dependent on the primary key. Each fees paid value is for a single student. date of birth: Yes, it’s specific to that student. address: Yes, it’s specific to that student. subject 1: No, this column is not dependent on the student. More than one student can be enrolled in one subject. subject 2: As above, more than one subject is allowed. subject 3: No, same rule as subject 2.
teacher name: No, the teacher name is not dependent on the student. teacher address: No, the teacher address is not dependent on the student. course name: No, the course name is not dependent on the student. We have a mix of Yes and No here. Some fields are dependent on the student ID, and others are not. How can we resolve those we marked as No? First, the subject 1 column. It is not dependent on the student, as more than one student can have a subject, and the subject isn’t a part of the definition of a student. I’ve called it subject name because that’s what the value represents. 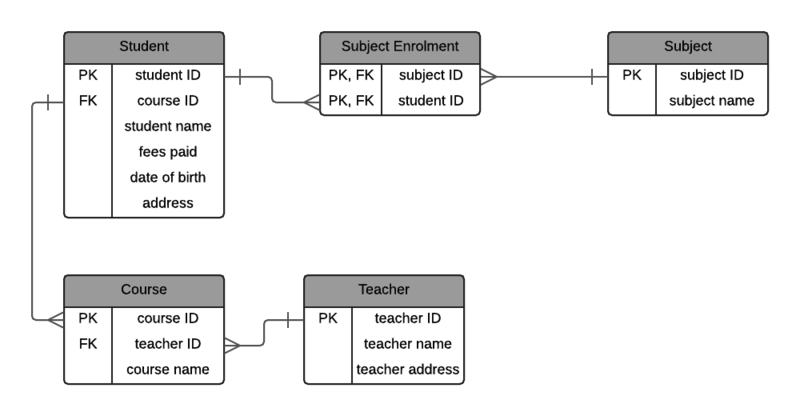 When we are writing queries on this table or looking at diagrams, it’s clearer what subject name is instead of using subject. Now, is this field unique? Not necessarily. Two subjects could have the same name and this would cause problems in our data. So, what do we do? We add a primary key column, just like we did for student. I’ll call this subject ID, to be consistent with the student ID. But they are in separate tables. How do we link them together? We’ll cover that shortly. For now, let’s keep going with our student table. The next column we marked as No was the Teacher Name column. The teacher is separate to the student so should be captured separately. This means we should move it to its own table. We should also move the teacher address to this table, as it’s a property of the teacher. I’ll also rename teacher address to be just address. The last column we have to look at was the Course Name column. This indicates the course that the student is currently enrolled in. While the course is related to the student (a student is enrolled in a course), the name of the course itself is not dependent on the student. So, we should move it to a separate table. This is so any changes to courses can be made independently of students. Let’s also add a primary key called course ID. How do we link these tables together? We still need to know which subjects a student is taking, which course they are in, and who their teachers are. We have four separate tables, capturing different pieces of information. We need to capture that students are taking certain courses, have teachers, and subjects. But the data is in different tables. How can we keep track of this? We use a concept called a foreign key. A foreign key is a column in one table that refers to the primary key in another table. 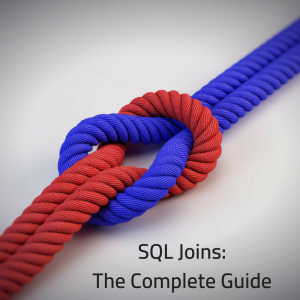 Related: The Complete Guide to Database Keys. It’s used to link one record to another based on its unique identifier, without having to store the additional information about the linked record. To link the two tables using a foreign key, we need to put the primary key (the underlined column) from one table into the other table. Let’s start with a simple one: students taking courses. For our example scenario, a student can only be enrolled in one course at a time, and a course can have many students. Does a table1 have many table2s, or does a table2 have many table1s? If it’s the first, then table1 ID goes into table 2, and if it’s the second then table2 ID goes into table1. Does a course have many students, or does a student have many courses? Based on our rules, the first statement is true: a course has many students. This means that the course ID goes into the student table. I’ve italicised it to indicate it is a foreign key – a value that links to a primary key in another table. When we actually populate our tables, instead of having the course name in the student table, the course ID goes in the student table. The course name can then be linked using this ID. This also means that the course name is stored in one place only, and can be added/removed/updated without impacting other tables. We’ve linked the student to the course. Now let’s look at the teacher. In our scenario, a teacher is related to a course. We need to relate these two tables using a foreign key. Does a teacher have many courses, or does a course have many teachers? This allows us to change the teacher’s information without impacting the courses or students. So we’ve linked the course, teacher, and student tables together so far. What about the subject table? Does a subject have many students, or does a student have many subjects? A student can be enrolled in many subjects at a time, and a subject can have many students in it. But if we do this, we’re storing many pieces of information in one column, possibly separated by commas. This makes it hard to maintain and is very prone to errors. If we have this kind of relationship, one that goes both ways, it’s called a many to many relationship. It means that many of one record is related to many of the other record. If we can’t represent this relationship by putting a foreign key in each table, how can we represent it? We use a joining table. This is a table that is created purely for storing the relationships between the two tables. It has two columns. Student ID is a foreign key to the student table, and subject ID is a foreign key to the subject table. Each row represents a relationship between a student and a subject. Student 1 is linked to subject 1. Student 1 is linked to subject 2. Student 2 is linked to subject 2. It allows us to store many subjects for each student, and many students for each subject. It separates the data that describes the records (subject name, student name, address, etc.) from the relationship of the records (linking ID to ID). It allows us to add and remove relationships easily. It allows us to add more information about the relationship. We could add an enrolment date, for example, to this table, to capture when a student enrolled in a subject. You might be wondering, how do we see the data if it’s in multiple tables? How can we see the student name and the name of the subjects they are enrolled in? Well, that’s where the magic of SQL comes in. We use a SELECT query with JOINs to show the data we need. 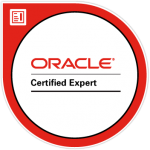 But that’s outside the scope of this article – you can read the articles on my Oracle HQ page to find out more about writing SQL. One final thing I have seen added to these joining tables is a primary key of its own. An ID field that represents the record. This is an optional step – a primary key on a single new column works in a similar way to defining the primary key on the two ID columns. I’ll leave it out in this example. I’ve called the table Subject Enrolment. I could have left it as the concatenation of both of the related tables (student subject), but I feel it’s better to rename the table to what it actually captures – the fact a student has enrolled in a subject. I’ve also underlined both columns in this table, as they represent the primary key. They can also represent a foreign key, which is why they are also italicised. This database structure is in second normal form. We almost have a normalised database. Now, let’s take a look at third normal form. What Is Third Normal Form? What does this even mean? What is a transitive functional dependency? It means that every attribute that is not the primary key must depend on the primary key and the primary key only. This means that column A determines column B which determines column C. This is a transitive functional dependency, and it should be removed. Column C should be in a separate table. We need to check if this is the case for any of our tables. Do any of the non-primary-key fields depend on something other than the primary key? We can see that there is a relationship between the ZIP code and the city or suburb. This is common with addresses, and you may have noticed this if you have filled out any forms for addresses online recently. How are they related? The ZIP code, or postal code, determines the city, state, and suburb. In this case, 56128 is South Boston, and 56125 is North Boston. (I just made this up so this is probably inaccurate data). This falls into the pattern we mentioned earlier: A determines B which determines C.
Student determines the address ZIP code which determines the suburb. So, how can we improve this? We can move the ZIP code to another table, along with everything it identifies, and link to it from the student table. I’ve created a new table called Address Code, and linked it to the student table. I created a new column for the address code ID, because the ZIP code may refer to more than one suburb. This way we can capture that fact, and it’s in a separate table to make sure it’s only stored in one place. Both of these tables have no columns that aren’t dependent on the primary key. The teacher table also has the same issue as the student table when we look at the address. We can, and should use the same approach for storing address. It uses the same Address Code table as mentioned above. We aren’t creating a new address code table. This table is OK. The course name is dependent on the course ID. So, what does our database look like now? So, that’s how third normal form could look if we had this example. For most database normalisation exercises, stopping after achieving Third Normal Form is enough. It satisfies a good relationship rules and will greatly improve your data structure from having no normalisation at all. There are a couple of steps after third normal form that are optional. I’ll explain them here so you can learn what they are. Fourth normal form is the next step after third normal form. Meet the criteria of third normal form. There are no non-trivial multivalued dependencies other than a candidate key. A multivalued dependency is probably better explained with an example, which I’ll show you shortly. It means that there are other attributes in the table that are not dependent on the primary key, and can be moved to another table. This meets the third normal form rules. However, let’s take a look at the address fields: street address and address code. What if a student moves addresses? Do we update the address in this field? If we do, then we lose the old address. If an address is updated, is it because they moved? Or is it because there was an error in the old address? What if two students have the same street address. Are they actually at the same address? What if we update one and not the other? What if a teacher and a student are at the same address? What if we want to capture a student or a teacher having multiple addresses (for example, postal and residential)? There are a lot of “what if” questions here. There is a way we can resolve them and improve the quality of the data. This is a multivalued dependency. We can solve this by moving the address to a separate table. The address can then be linked to the teacher and student tables. Let’s start with the address table. In this table, we have a primary key of address ID, and we have stored the street address here. The address code table stays the same. We need to link this to the student and teacher tables. How do we do this? Do we also want to capture the fact that a student or teacher can have multiple addresses? It may be a good idea to future proof the design. It’s something you would want to confirm in your organisation. For this example, we will design it so there can be multiple addresses for a single student. The address code ID has been removed from the Student table, because the relationships between student and address is now captured in the joining table called Student Address. The teacher’s address is also captured in the joining table Teacher Address, and the address code ID has been removed from the Teacher table. I couldn’t think of a better name for each of these tables. Determine which students or teachers live at the same address with certainty (it’s linked to the same record). So, that’s how you can achieve fourth normal form on this database. Combine the student and teacher tables into a person table, as they are both effectively people, but teachers teach a class and students take a class. This table could then link to subjects and define that relationship as “teaches” or “is enrolled in”, to cater for this. Split the address into separate fields for unit number, street number, address line 1, address line 2, and so on. Split the student name and teacher name into first and last names to help with displaying data and sorting. These changes could improve the design, but I haven’t detailed them in any of these steps as they aren’t required for fourth normal form. I hope this explanation has helped you understand what the normal forms are and what normalization in DBMS is. Do you have any questions on this process? Share them in the section below. 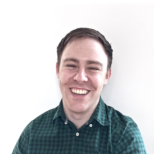 Lastly, if you enjoy the information and career advice I’ve been providing, sign up to my newsletter below to stay up-to-date on my articles. You’ll also receive a fantastic bonus. Thanks! Thanks so much for explaining this concept Ben. To me as a learner, this is the best way to grab this concept. You broke this down to the last atom. Thanks James, glad you found it helpful! Sure, I’ll check this and update the post. Saludos Ben, la simbología de Courses y Student según planteaste es de “1 a n” verifica si sería ” -< "